The EU bailout saw €17.5 bn from the NPRF. Then there’s the ‘loans’ from the EU, IMF and UK/Denmark and Sweden which would account for €67.5 bn. Sundry other costs can be thrown in. So let’s say we had €100bn. That’s a lot of cash, but Apple currently has approximately that in cash reserves right now so it’s not an impossible number to reach especially over a number of years. So what would that get you? There’s a web page here which suggests that it cost $100bn at 1994 rates to land on the Moon. But even accounting for inflation we wouldn’t necessarily have to follow all the steps. For a start we could double up some of the missions and vehicles, perhaps by moving straight to a three or more person capsule and eschewing either the Mercury or Gemini elements of the program. Now here’s the thing – Space X has developed, built and launched a reusable spacecraft that docked with the ISS for the paltry sum of $800 million. There’s already plans to build a version that could make it Mars. So a chunk of the R&D has already been done. Their model of providing resupply services to the ISS would also be a source of income to plough back into the program. That’s all well and good but what about some of the other practicalities of skilled people to actually run such a program or even build anything. As it happens, Ireland is already involved with the ESA since 1975 and has an active (if small) space industry. It’d need to scale up, but that would provide jobs and direct investment that paying off bondholders doesn’t. Just think. For less than the bailout, we could gather up all the architects of our current situation and bundle them into a capsule bound for Mars and still come out ahead. We could even televise their one way trip for even more money. All in the name of science. 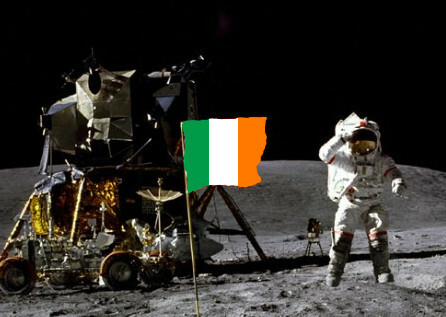 An Irish Space Programme and an Irish Base on the Moon! What do you mean we spent the money already? A version of this post also appeared on Broadsheet.ie. Previous Previous post: Invalid IPA: The keychain-access-group in the embedded.mobileprovision and your binary don’t match.